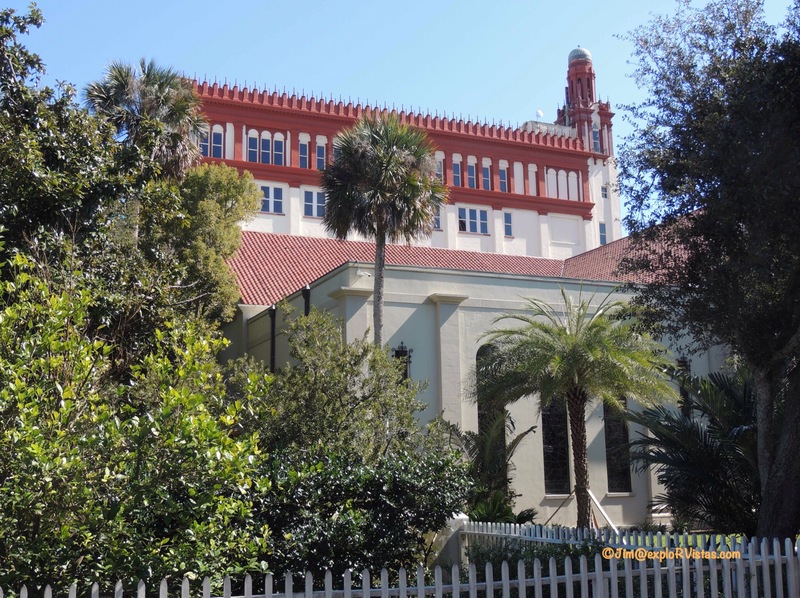 In northeast Florida lies the oldest continually occupied settlement in the United States, St. Augustine. 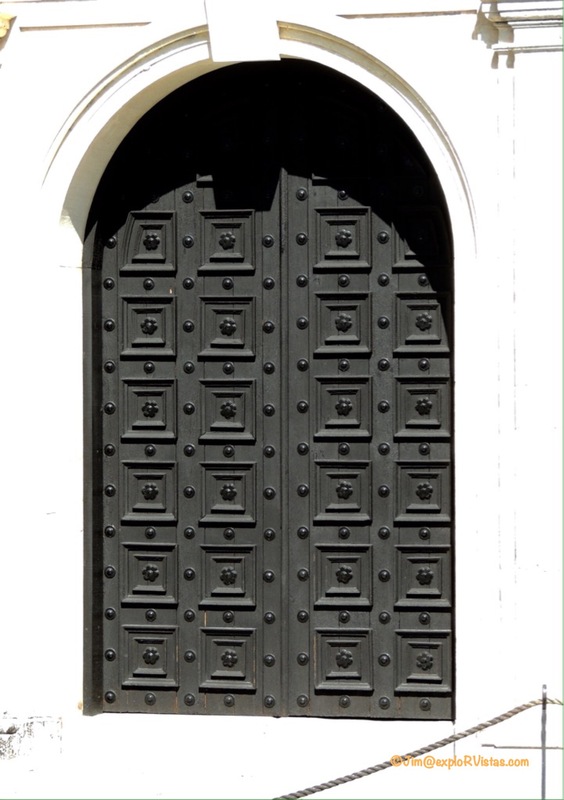 Founded in 1565 by Spain, this charming place has amassed a fair amount of history in the past 450 years. Diana and I decided to check out this interesting community on February 10. 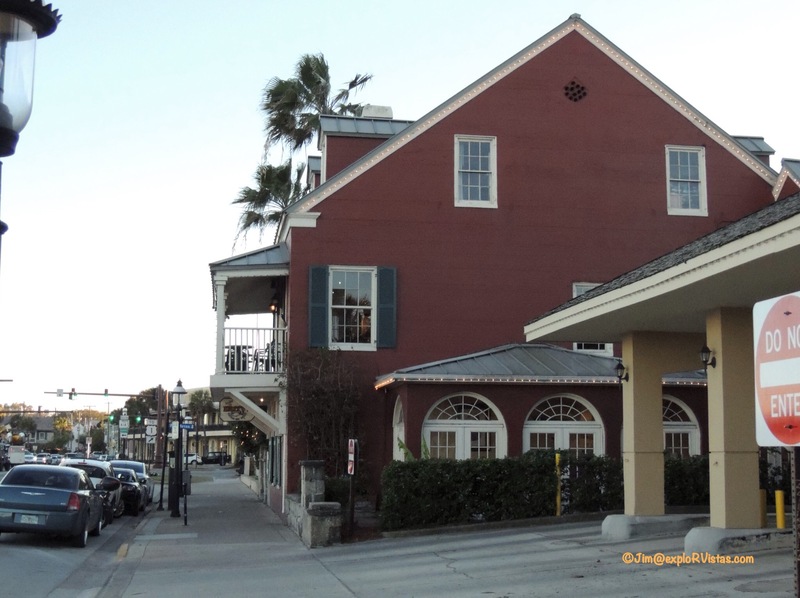 We had dinner at Harry’s Seafood, a suggestion that our friends Rod and Mary had given us. The food was good and we enjoyed the New Orleans ambiance. The restaurant is directly across the street from the waterfront. 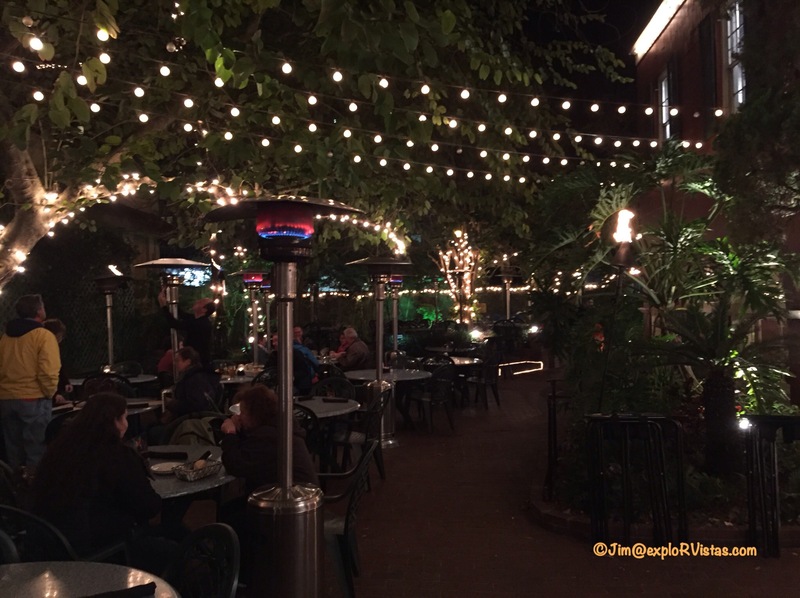 They have a charming outdoor patio with heaters; had it been a touch warmer, we would have eaten out there. We spent the night at the Doubletree by Hilton, which we found to be a very nice hotel. The staff went out of their way to be helpful, and our room was immaculate. A special shout-out to our breakfast server Bill, who was very attentive and friendly. After breakfast, we crossed the street and visited the Shrine of Our Lady of La Leche. 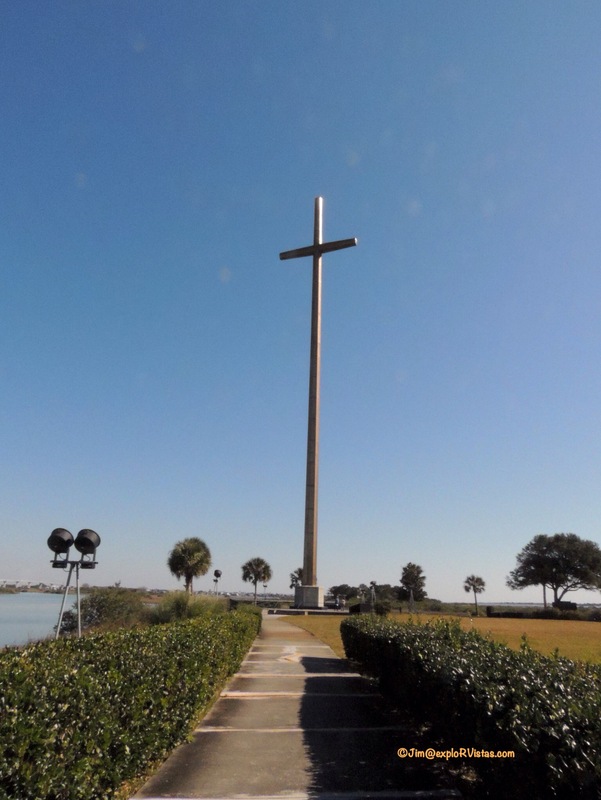 This 208 foot cross, the tallest in the world, marks the spot where Christianity was first proclaimed in what is now the United States. The museum was interesting and the grounds were pretty. 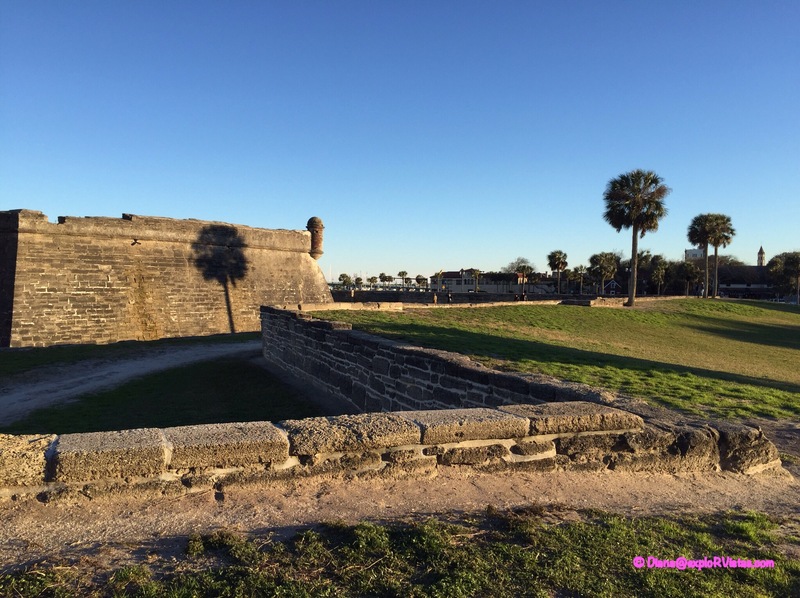 The centerpiece of St. Augustine is the Spanish fort, Castillo de San Marcos. The first version of the current masonry fort was constructed over 23 years, between 1672 and 1695. There were many additions and improvements since then. The key to the success of this fort is the unique masonry used in its construction; a locally quarried conglomerate known as coquina. Translated in Spanish, the name means ‘small shells’….and that is exactly what it is….blocks of small sea shells bonded together over millienia. Just using what they had on hand, the Spanish didn’t find out until the fort came under siege by the British in 1740 just how good the coquina was. 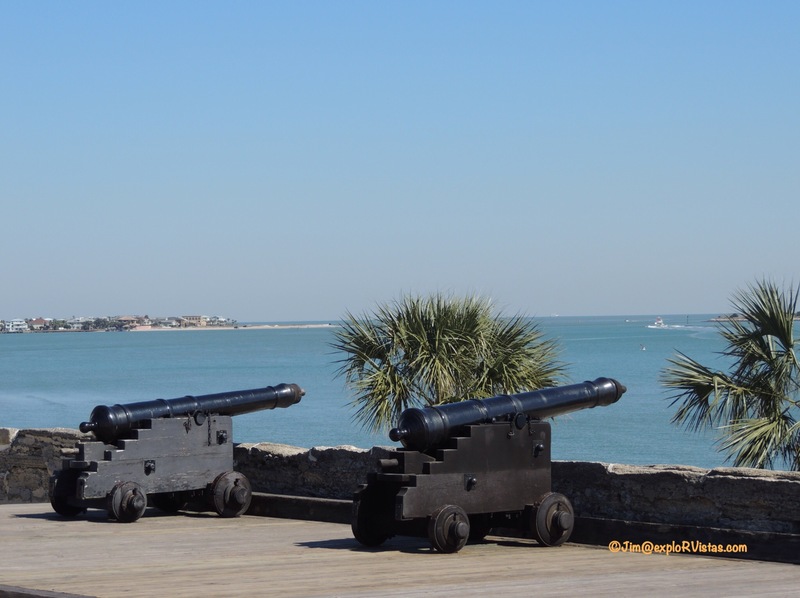 For two months, the British showered the fort with cannonballs, only to have them bounce off the walls. 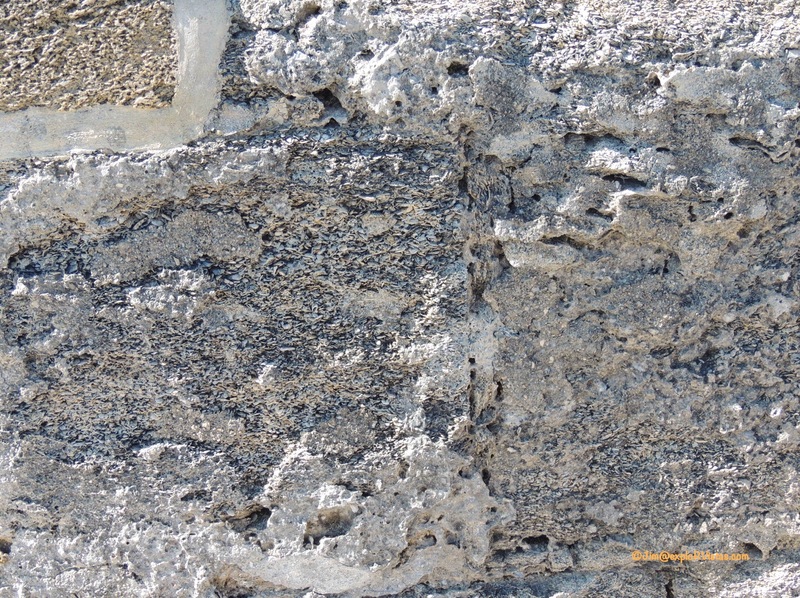 It turns out the air pockets in the coquina acted like shock absorbers, and the cannon fire only resulted in small dents in the surface. Eventually the British were trapped by Spanish reinforcements sent up from Havana, resulting in the Brits burning their ships and retreating to Carolina on foot. 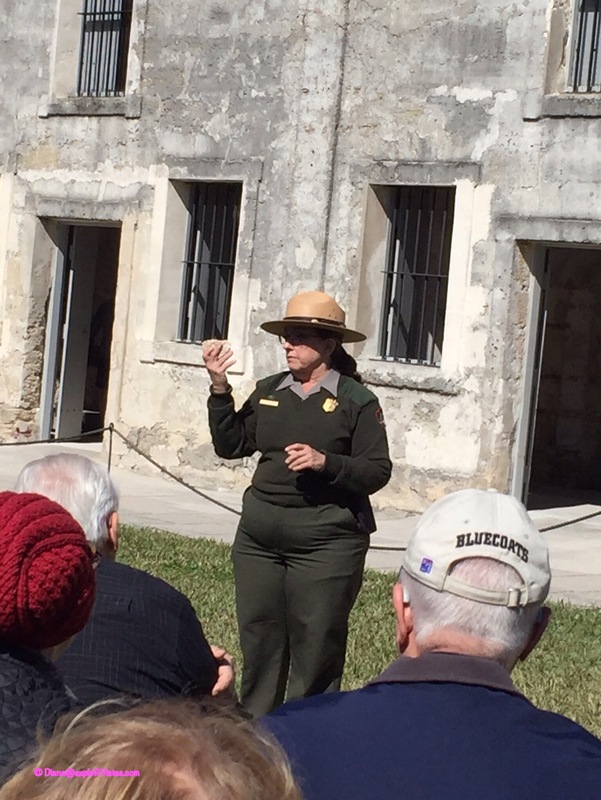 This is an interpretive talk being given by a National Park ranger, explaining coquina’s superior properties to us. On the wall behind her, what appears to be a second story is actually the upper window of each room. Every one of the chambers are constructed with arched ceilings, which support the weight of the deck and cannons above. 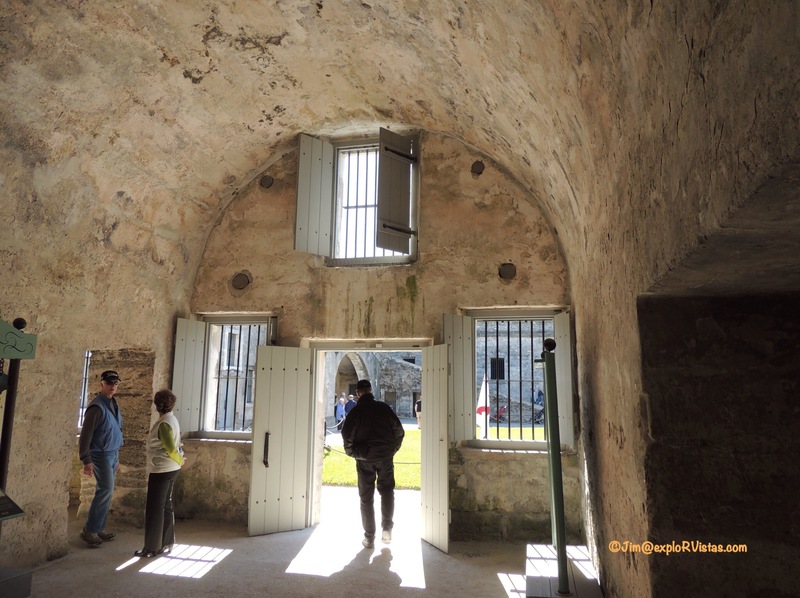 This photo shows the arched ceilings. The legendary Seminole chief Osceola was held in this room in 1837, prior to being sent to Fort Moultrie in South Carolina where he died of what is believed to have been malaria. The view of the harbor from the upper deck is breathtaking, to say the least! 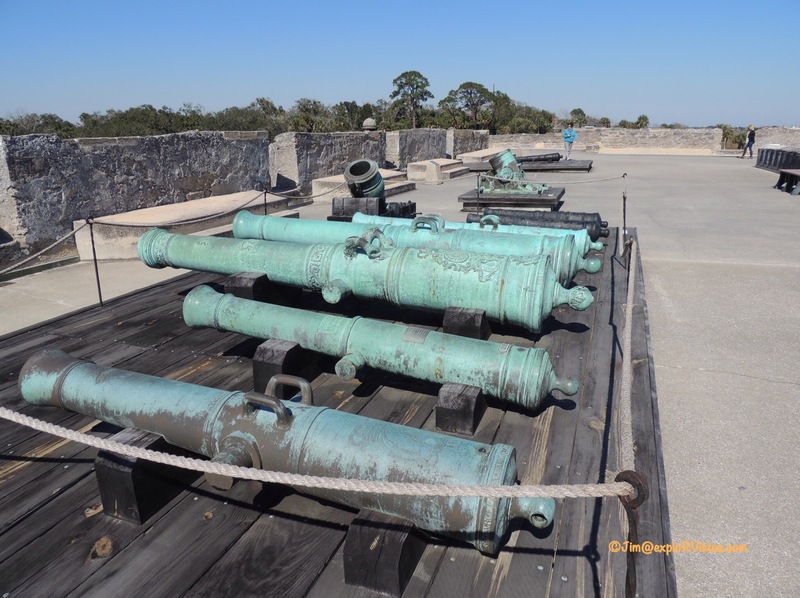 Here is a selection of several of the different types of cannons used over the years by the various occupying armies. The fort changed hands six times: Spain (1672-1763), Great Britian (1763-1784), Spain (1784-1821), United States of America (1821-1861), Confederate States of America (1861-1862), and finally the United States of America (1862 – present). We thoroughly enjoyed exploring the fort, and we will surely visit again in the future. After the fort, we walked up St. George Street. There are many restaurants and shops along this pedestrian only road. 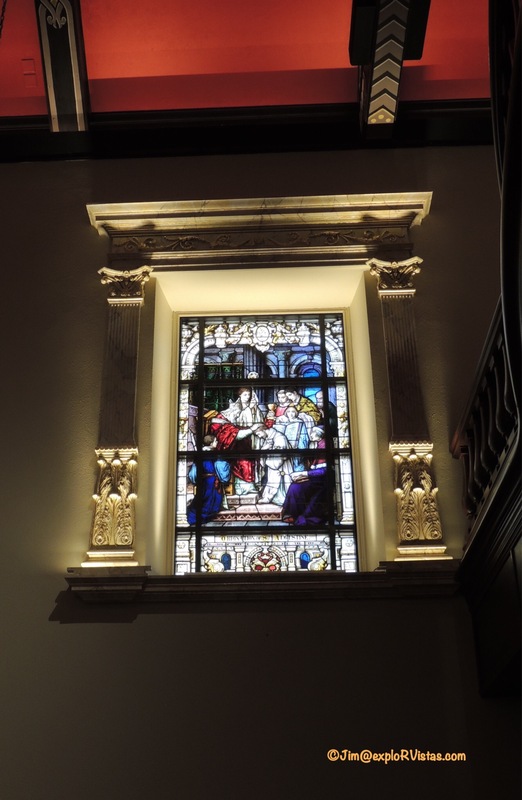 At the southern end, we visited the Cathedral Basilica of St Augustine. This building is an amazing example of Mediterranean archtecture. The interior was gorgeous with its Spanish influence. There are many more places we didn’t have time to visit. We will be sure to check them out when we return to the area. With that being said, we are heading out from Melbourne Beach. We will be more mobile and less stationary for the next two months. Stay tuned as we reveal our destinations as we go! Search and shop Amazon.com here for just about anything imaginable. We didn’t get enough time in St. Augustine. So much to see! Thanks for your great pictures and stories. Thanks, Debbie! We could easily spend a month there. So much to see…so much history! That’s beauty of being mobile… you can always come back at your leisure. Not jealous or anything…. not a bit, nope, uh uh. If you believe that…. Brian, you have to move that timeline up! What was your target date again? I have to laugh the way people always have to find some way to be unique. That 208 FOOT cross may be the tallest. Effingham IL has one that they claim is the LARGEST — only 198 feet tall but some 208 TONS of concrete and steel. Did you get to see the other church? The one that Flagler and his daughter are buried in? The something memorial church or chapel? It is open during the week, but not for visitation on Sunday (the day we were there. I hope to see that one when we return with Kathryn and Michael next week. Lots of fun walking around that town and people watching! No, we will check that out next time, Peter. From what we heard, the cross swayed in the breeze too much, so they filled it halfway up with concrete. I imagine it might not fare well in a hurricane. I was looking at that when we were there. The two crosses are very different even though similar in height, and I think you’re right about stability in a big blow. 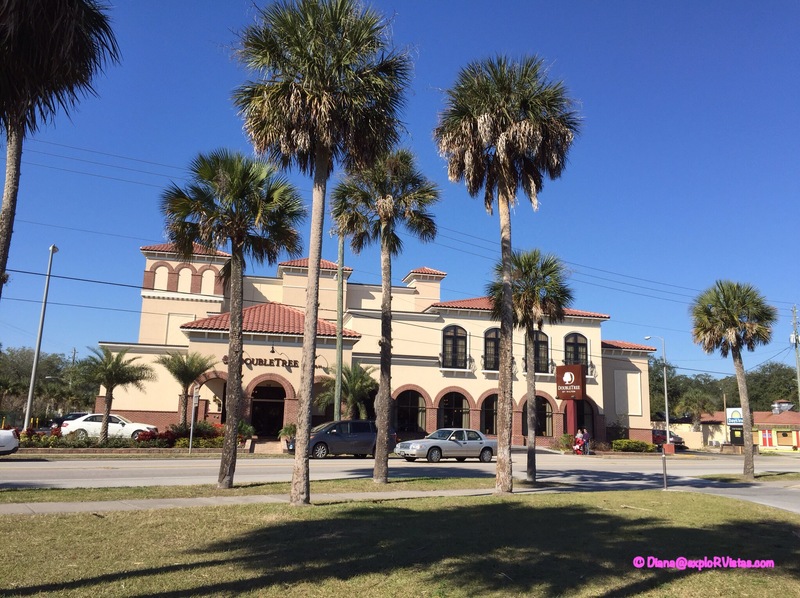 Very nice post about St. Augustine. It’s been years since we’ve been there and it is on our list of one of those places we would like to see again. Thanks, Beth! We definitely want to do more exploring there. We enjoy your adventures very much. Our house go’s on the market next Tuesday, hopefully we’ll be in Florida on June 1st to set up our domicile. Hope to meet up on the road. Thanks, Mike! Congrats on getting the house on the market! As many times as we’ve been in FL, we have not made it to St Augustine. Definitely on “the list”! Thanks for all the great info! You will love it, I am sure, Kelly! Looks like a lovely old town. I love the simpler, yet lovely Spanish style cathedral. Can’t wait to see where you travels take you next! Thanks, Gin! Diana and I would love to be US National Park rangers! We may…you never know! Not sure how difficult it is. 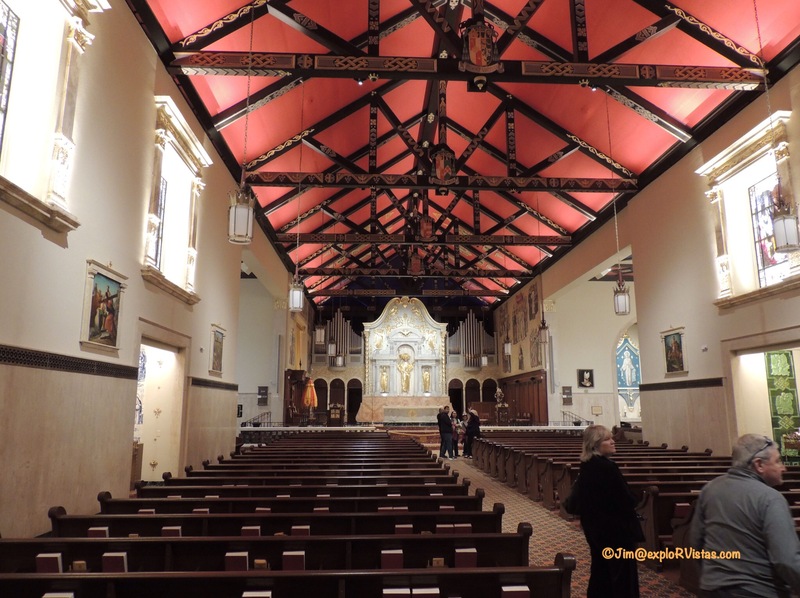 I have always enjoyed our visits to St Augustine. It’s such a great walkable city with so much to do. The live music every where is great. But you didn’t say, Did you drink the water? Thanks Tracy! Your camperchronicles.com is always well written and full of great information. Diana and I love our national parks. We would love to ‘wear the hat’ of a park ranger; that job would be a dream come true, for sure.